A heated rivalry that “shares absolutely no love”. Two undefeated teams that have scored 15 goals in their opening three games. The competition’s first streamed game on BarTV Sports. The Match of the Round at Wallsend Park this Sunday has all the hallmarks of an instant blockbuster, and it’s already shaping up to be a thrilling affair as Wallsend and South Wallsend clash for the first time in 2019. South Wallsend has scored two big wins in the Herald Women’s Premier League so far, and they’re looking to make it a third straight when they face their local rivals come Sunday afternoon. “There’s definitely a statement to be made there, but we also want to just play the football that we know we can play,” South Wallsend coach Cas Wright said ahead of the rivalry battle. “It’s a local derby, and there’s been some bad blood, we’ve had a couple of players leave Southy for Wallsend, and vice versa. Because of that, there’ll be a question about whether we can play the football we want to because of the game’s tension. Wright also confirmed the team will still be without W-League Jets star Gema Simon due to her commitments with the Matildas. She also confirmed defender Kalista Hunter (ankle) was still a doubt ahead of the derby but said they weren’t “too concerned” about rushing her back into the side. On the other side of the dugout, Brad Jones is preparing Wallsend Park for a lukewarm reception of Wallsend’s local rivals. “It’s always a big one, you don’t need to motivate the players for this one – they’re all up ready to face South Wallsend,” Jones said. “If you listen to everyone that’s talking they’re all saying that the Big 4 have already made it into the semi-finals so I think Southy are going to come in as the favourites. “However, there’s a lot of belief in our squad and we aren’t listening to the pundits that are saying there’s a gap between the top four and everyone else. New Lambton is set to face Adamstown this weekend at the Adamstown No.1 Oval after both teams played last weekend despite the game-ending storms that cut the round in half. The Eagles bagged a 7-nil win as they played out their game against Football Mid North Coast in the second round, and head coach Keelan Hamilton is eager for more of the same when they travel to face the Rosebuds this Sunday. “After a positive performance and result against Football Mid North Coast we need to make sure we back that up again with another good performance on Sunday,” Hamilton said ahead of the round 3 clash. The Rosebuds prepare for their third challenging fixture of the year as they play another home fixture, and Paul Devitis has confirmed the team will score a much-needed boost in the form of returning vice-captain Maggie Quinn. I think it’s going to be a challenge playing against a high-quality team, but not one we’re going to shy away from at all,” Devitis said. Adamstown boasts a completely new-look centre back pairing in Isabel Lauina and Elly Cook in 2019, and Devitis has pinpointed their growing synergy as a key part of their defensive plan. “We’ve had Issy and Elly come into the team after some changes in the offseason and they’re still bedding in together, it’s only been two games so far,” the Rosebuds helmsman said. “Between Maggie [Quinn] coming back into the side with her commanding voice in the midfield and the two of them at the back getting used to each other, we’re just going to keep improving as we face these early season challenges. After opening their season with a 9-1 win, Warners Bay then suffered a postponed round at the hands of the weather. Now, returning to play in the third week, the team welcomes Thornton to John Street Oval. Although the Panthers scored the highest goal tally of the first six games played, coach Antonio Ambrogetti has other plans for his side as they prepare to host the Redbacks. “We’re not going to underestimate any team, that would be a mistake, so we’re just going to play our own game and see how we go,” Ambrogetti said. “This early in the season I’d rather lose 1-nil than win 5-4 because the second result means we won the game but we conceded four goals which means there’s bigger problems. Defence is also a focus on the other side of the pitch, as Thornton’s coach Alan Primmer still has the six goals conceded in the first round at the back of this mind. “We’ve taken a focus on developing youth for this season, so it’s all about learning how to play together and stay sharp,” Primmer said. “I think after we conceded a few against Wallsend our heads dropped so we’ve looked to focus on breaking past that. “The team is a work in progress after everything that happened last year, so it’s a different kettle of fish for us compared to some of the other clubs in the league. Primmer confirmed Kirstie Power-Walford and goalkeeper Grace Harvey were both still in major doubt for the upcoming clash and said the lineup could be “a little makeshift” once the starting eleven had been assessed on Friday evening. 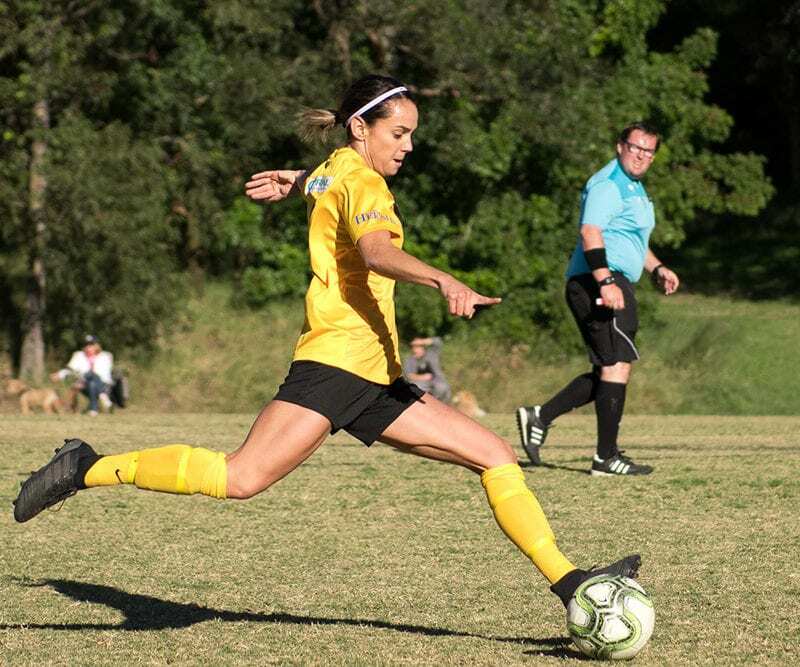 Merewether United will look to continue their quest to defend their premiership against Football Mid North Coast in the final match of the third week. After having their match last weekend postponed due to weather, United will now look to re-find their feet early in the season, while FMNC searches for their first goals of the 2019 season. While a win would be a great result for the returning Mid North Coast side, coach Mick Grass knows his focus is first and foremost on bedding the players into the new level of competition the team is now facing. “It’s good for us to have another run out under our belt and it’s a bonus for us that Merewether missed a week, but it’s going to be a tough game regardless,” Grass said. “They were a champion side last year so it doesn’t get any easier for us. “Our focus is, of course, about getting our players through to the first grade and giving them a higher level of development, and getting them out of their comfort zone. As United travel north, they leave behind a lengthy list of unavailable and injured players, including possibly Westfield W-League striker Rhali Dobson. Merewether coach Cass Koppen confirmed the forward “might still be ruled out” for the Round 3 clash. Leah Giuffre, Jane McDonald, Ellie Withers and Georgia Minors were also confirmed unavailable for the match in Taree. Bridget Holt, who suffered an ACL/MCL injury in the first round of the year, has been permanently ruled out. “With so many players out it could be a difficult game to us, but we’re good at adapting and really keen to get the three points after losing in the opening round,” Koppen said. “We’ll have a few juniors start for us, it’s going to be a tough game but hopefully these younger girls will take the most of the opportunity and step up for this game.